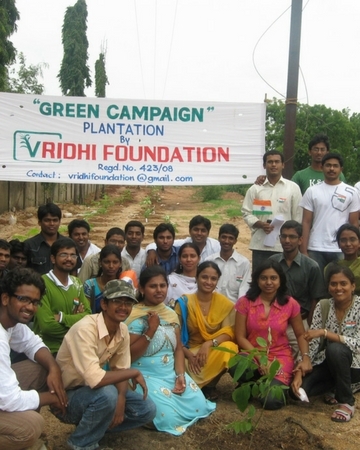 Vridhi Foundation, a dream turned into a reality, was started as a NGO based in Hyderabad working towards saving the very abode we live in, i.e. Earth. It all started with a bunch of guys talking over an evening routine chat that people have every day over a topic. We happen to watch a documentary by Al Gore, the former vice president of USA and that was when the spark ignited. We were in the midst of our career crossroads but wanted to make a difference no matter how short a time it was for. The NGO was established in 2008 with the support of great advisors, friends and volunteers and in the span of next 3 years, we toiled hard surpassing our own expectations, making us realise how a small group of unknown faces could make an impact, no matter how small it was. We have been involved in plantation drives, water conservation campaigns, climate change awareness campaigns, wildlife conservation activities and rural development surveys. We have worked alongside various government bodies and NGOs active in the above mentioned activities. It was supposed to be a small amateurish effort of a few young people in their early 20s trying to make a difference but it turned out to be a very big responsibility to shoulder. You often hear that time teaches you a lot in its journey and we believe we have come quite far and are ready to shoulder the responsibility of what started as a small effort. Like our life, our activities are taking new form but the vision stays the same.